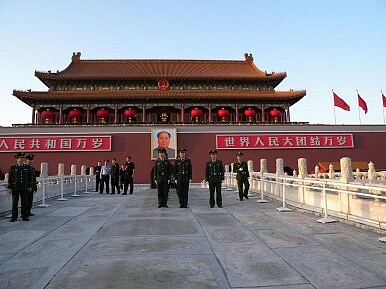 China’s Internet has been abuzz with rumors of a coup. It’s unlikely, but still highlights real tensions in Beijing. Fresh from creating headlines around the world with rumors of the demise of North Korean leader Kim Jong-un last month, Chinese microblog users have been at it again, with the Internet in China lighting up yesterday with rumors of a coup. But in both cases, there were understandable reasons why the rumors took off. In North Korea, with talk of Kim Jong-un struggling to assert his authority following his father’s death (which itself was only discovered by the outside world when it was announced on an official news bulletin), the idea that Kim Jong-il’s son had been assassinated didn’t sound so outrageous to many. Similarly, these are strange times in China – a neighbor that tries to keep an iron official grip on the flow of news. With the firing of the high-profile and populist Bo Xilai under mysterious circumstances last week, and with growing talk of a power struggle ahead of the transfer of the national leadership this autumn, it’s little wonder that bloggers are stepping in to fill the official information void. Indeed, even when the official media is releasing information, it is only serving to further fuel the rumor mill. As the Los Angeles Times noted today: “State media reported this week that 3,300 party cadres from the security apparatus would be sent to Beijing for ideological retraining. The order was unusual enough, but even more so was the fact that the report omitted mention of internal security czar Zhou Yongkang, who heads the Political and Legislative Affairs Committee that is recalling the cadres. As regular The Diplomat contributor Minxin Pei notes, the idea of a coup is fanciful. Still, China’s Communist Party, ever obsessed about stability – and, just as importantly, the impression of stability – has seen its efforts at ensuring a smooth looking transition this year blown apart.